What’s on the test is what’s taught. PARCC and Smarter Balanced [versions of the Common Core tests] only evaluate math and literacy, and thus science, social studies, and the arts are lost to spend maximum instruction time on the tested material. There is no time for creativity, collaboration, and curiosity. A Rethinking Schools reader, Texas educator Noreen Naseem Rodriguez, wrote to say: not so fast . Rodriguez pointed out that teachers are still “creative and collaborative, and encourage curiosity in spite of the high-stakes testing environment.” She argued that we need to distinguish between what teachers are being pushed to do and what they are actually doing. Yes, the tests have made it more difficult to teach critically and authentically, but Rodriguez pointed out that simply because people in positions of power want something to happen, doesn’t make it so. Rodriguez is right. Teachers continue to resist the high-stakes testing machine by teaching what matters, by doing everything possible not to narrow the curriculum to test prep. And when we say that the corporate school reform agenda has killed critical, imaginative teaching for social justice, we have declared defeat while the fight rages around us. Since its inception almost 30 years ago, Rethinking Schools’ mission has been the defense and transformation of public schools. These go hand in hand. Yes, we need to fight the myriad ways that the forces of privatization and privilege seek to discredit and destroy public education. But one front in that defense is the effort to revitalize classroom life, to ensure that students’ time in school is worthwhile—for students personally, and for the larger communities and society they belong to. As we argued in the first edition of Rethinking Our Classrooms: Teaching for Equity and Justice , back in 1994, classrooms should be grounded in the lives of our students; critical; multicultural, antiracist and pro-justice; participatory and experiential; hopeful, joyful, kind, and visionary; activist; culturally sensitive; and academically rigorous. We set ourselves the task of creating curriculum and finding teaching stories to bring these principles to life. Is this kind of teaching made much harder by today’s standardized testing mandates? No doubt. Valuable classroom time has been hijacked by the tests and test prep. New legislation and policies threaten teachers with bad evaluations or worse should their students fail to perform adequately on the tests. In some school districts, armies of clipboard-carrying curriculum cops circulate through classrooms to enforce scripted teaching strategies. These are tough times, and we do not mean to minimize the power of this bullying to stifle good teaching. Since Rethinking Schools began publishing in 1986, there have always been odious requirements that teachers have confronted and resisted: basal readers, detailed “scope and sequence” instructions, “competencies” to be met, “anchor assignments,” required textbooks, and overbearing administrators. Indeed, in the very first issue of Rethinking Schools , RS co-founder Rita Tenorio described how she resisted the imposition of a Scott Foresman basal reader on her kindergarten students. Instead she provided experiential, playful, and collaborative literacy activities far more appropriate for young children than a dreary succession of worksheets. Sometimes it’s a collective effort. In Portland, Oregon, teachers at several high schools are collaboratively constructing and teaching curriculum. Social studies teachers at one school, for example, created a unit on the Russian Revolution that was taught in 14 classes. At another school, language arts teachers developed and taught curriculum on local school desegregation as a follow-up to reading Warriors Don’t Cry when a student asked, “So what happened in Portland?” After they taught the unit, the teachers traveled to each other’s classrooms to discuss revisions and adaptations, and to look at student work. Two articles in this issue of the magazine, Jerica Coffey’s “Storytelling as Resistance” and Stephanie Cariaga’s “Research as Healing,” are the result of an inquiry group created by teachers at a school in the Watts neighborhood of Los Angeles (see Collaborating to Capture Community Resilience). This resistance is fueled by networks of social justice teachers in groups like Teachers 4 Social Justice in San Francisco, the New York Collective of Radical Educators, Chicago Teachers for Social Justice, the Educators Network for Social Justice in Milwaukee, Teaching for Change, the Oregon Writing Project, and Free Minds, Free People. These organizations, and many others, inspire critical teaching through conferences, workshops, and inquiry-to-action groups—defying the corporate push toward standardization. Rethinking Schools’ two latest books, A People’s Curriculum for the Earth: Teaching Climate Change and the Environmental Crisis and Rhythm and Resistance: Teaching Poetry for Social Justice offer further proof that teachers across the country are working with one another to address vital social issues at the same time they strive to develop academic skills. Howard Zinn famously said that “you can’t be neutral on a moving train.” When it comes to the climate crisis, endless war, growing income inequality, and the disregard for the lives of people of color as shown by the regularity of police killings, the social train we’re on is headed off a cliff. Teachers need to do our part to stop and redirect that train. As we oppose the hegemony of standardized tests, the budget cuts, the school closures, the pro-charter legislation, the infiltration of Teach For America, and other privatization schemes, we also should demand teaching and learning conditions that allow us to create an alternative vision of classroom life. In order to design curriculum that speaks to students’ lives, we need more prep time, more time for teacher collaboration, more professional development worthy of its name. We need to nurture a grassroots conversation about social justice teaching—one that refutes the notion that learning and high test scores are synonymous; and one that opts for joy over misery. 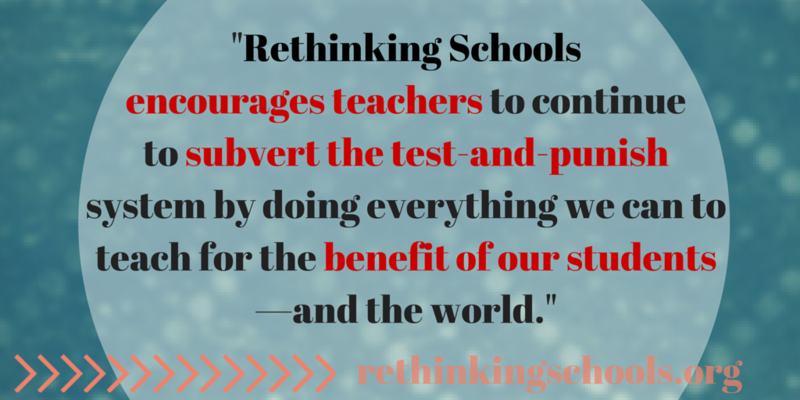 Rethinking Schools encourages teachers to continue to subvert the test-and-punish system by doing everything we can to teach for the benefit of our students—and the world. Every child-centered, socially aware lesson plan is a gesture of defiance to those who endeavor to make test scores the sole criterion of educational success. This kind of teaching that matters is part of the broader struggle to defend and transform public schools. Editor’s note: This news has been making the rounds in education activist circles, and we wanted to further amplify this important message. Turns out corporate style reform isn’t just bad for schools, it’s bad for corporations. Schools have a lot to learn from business about how to improve performance, declared Bill Gates in an Op Ed in the Wall Street Journal in 2011. He pointed to his own company as a worthy model for public schools. The Microsoft model, called “stack ranking” forced every work unit to declare a certain percentage of employees as top performers, certain groups as good performers, then average, then below average, then poor. 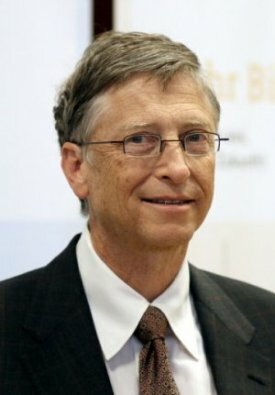 Using hundreds of millions of dollars in philanthropic largesse Bill Gates persuaded state and federal policymakers that what was good for Microsoft would be good for public schools (to be sure, he was pushing against an open door). To be eligible for large grants from President Obama’s Race to the Top program, for example, states had to adopt Gates’ Darwinian approach to improving public education. Today more than 36 states have altered their teacher evaluations systems with the aim of weeding out the worst and rewarding the best. Some states grade on a curve. Others do not. But all embrace the principle that continuing employment for teachers will depend on improvement in student test scores, and teachers who are graded “ineffective” two or three years in a row face termination. Needless to say, the whole process of what has come to be called “high stakes testing” of both students and teachers has proven devastatingly dispiriting. According to the 2012 MetLife Survey of the American Teacher, over half of public school teachers say they experience great stress several days a week and are so demoralized that their level of satisfaction has plummeted from 62 percent in 2008 to 39 percent last year. And now, just as public school systems have widely adopted the Microsoft model in order to win the Race to the Top, it turns out that Microsoft now realizes that this model has pushed Microsoft itself into a Race to the Bottom. This month Microsoft abandoned the hated system. Ms. Brummel listed four key elements in the company’s new policy. More emphasis on teamwork and collaboration. More emphasis on employee growth and development. No more use of a Bell curve for evaluating employees. No more ratings of employees. Big business can turn on a dime when the CEO orders it to do so. But changing policies embraced and internalized by dozens of states and thousands of public school districts will take far, far longer. Which means the legacy of Bill Gates will continue to handicap millions of students and hundreds of thousands of teachers even as the company Gates founded along with many other businesses, have thrown his pernicious performance model in the dustbin of history. We’re pleased to announce that the summer issue of Rethinking Schools magazine features a special forum with three perspectives on edTPA, the high-stakes test for new teachers that is being piloted in teacher education programs around the country. We know edTPA is an issue of great interest to everyone in the field of education as we consider how best to maintain teaching as a profession. In that spirit, we invite you to read the articles and join the critical conversation about edTPA in the comments section of this blog post. We also invite you to consider donating or subscribing to Rethinking Schools if you don’t already do so. Because we feel so strongly about the need for education and reflection on the edTPA, we opened up the majority of this issue to nonsubscribers, but as a nonprofit independent publisher, we rely on your donations and subscriptions to keep us going. Thanks for reading, donating, subscribing, and supporting critical conversation. In “Wrong Answer to the Wrong Question,” Barbara Madeloni and Julie Gorlewski disagree. The edTPA distorts the teacher education process, they say, and opens the door to Pearson reaping more profits and power. 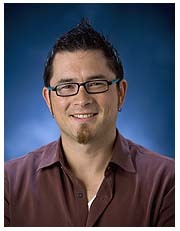 “What’s a Nice Test Like You Doing in a Place Like This?” by Rethinking Schools editor Wayne Au, puts the discussion in the context of corporate education “reform” as he shares his experience with the test in his own teacher education program. As you are no doubt aware, increasingly powerful corporate interests are attempting to reduce teaching and learning to what’s on a standardized test. We have all seen these tests be used to punish students, discipline teachers, withhold funds from our schools, and even close schools down. However, a movement of parents, students, and teachers has been growing around the country that has been pushing back against these tests and calling for education and assessment that is relevant to students and empowers our youth. In Seattle, teachers at the school where I teach, Garfield High School, announced in January, 2013 that they would refuse to give the Measures of Academic Progress (MAP) test, calling it a waste of time and resources. The boycott soon spread to other schools around the city. Our boycott was very successful during the winter testing period. However, now the Seattle School District is asking us to give the MAP test again for the spring testing session. In response, we are calling for an international day of action in the struggle against flawed tests and in support of the MPA test boycotting teachers on May Day, Wednesday, May 1. We encourage you to participate in the day of action in any way you and your fellow educators feel is appropriate. Please read the call to action below and send us your statements of solidarity. Seattle’s boycotting teachers need your support for their “educators’ spring” uprising against the MAP test. Seattle Education Association in solidarity with Garfield High School. 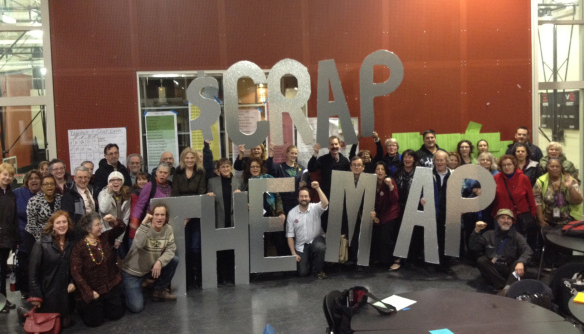 On January 9, 2013, teachers at Garfield High School in Seattle announced a unanimous vote to boycott the district mandated Measures of Academic Progress (MAP) test, which they said was not aligned to their curriculum, was a waste of their students’ time and resources, and unfairly targeted the most vulnerable populations. Specifically, Garfield’s teachers expressed their opposition to the fact that English Language Learner students are required to take the MAP test most often, causing them to miss out on vital instructional time in the classroom. In this way, the boycott of the MAP test should be viewed as part of the movement for the rights of immigrants and people from all cultures, nationalities, and linguistic backgrounds to have access to a high quality public education. Garfield High School’s Parent Teacher Student Association and the Associated Student Body Government both voted unanimously to support the teachers’ boycott of the MAP test. Soon afterwards, several other Seattle schools joined the boycott—Orca, Chief Sealth, Ballard, and Center School. Teachers at those schools were originally threatened with a 10 day suspension without pay, but because of the overwhelming solidarity from parents, teachers, and students from across the country, the Seattle School District backed down and declined to discipline any of the boycotting educators. Since then, several other schools have joined the boycott, a survey of Seattle teachers was conducted that shows overwhelming opposition to the MAP test at every grade level, and the movement for quality assessment has spread throughout the nation. Now the Seattle teachers need your support again. The spring offering of the MAP test produces the scores that are supposed to be used in Seattle’s teacher evaluations. For this reason the Seattle School District could take a harsher stance against boycotting teachers this time around. May Day is traditionally a day of international workers solidarity. What better time to show your support for the teachers who have risked their livelihoods to advocate for quality assessment and for our resources to be used to support learning rather than endless testing? We, the Seattle MAP test boycotting teachers, pledge our solidarity to teachers around the world who are struggling for an education system that supports and empowers our students with curriculum and assessments that are relevant to their lives. In turn, we ask for your support as we struggle for these very goals. boycotting a flawed test in your region. Furthermore, we, the MAP test boycotting teachers, would very much appreciate being informed about struggles teachers are engaged in around the world. Please let us know if there are any ways we can support your efforts for educational justice. Friday’s indictment of 35 Atlanta educators for a massive testing scandal should give pause to all people who care about the future of education and our children. The indictment by a Fulton County grand jury charged the former superintendent Beverly Hall with racketeering, theft, influencing witnesses, conspiracy and making false statements. She could face up to 45 years in prison. The underlying story behind this scandal is that when school “success” is reduced to data-driven standardized test scores, the consequences are devastating. Cheating is only the tip of the iceberg. An even more troublesome consequence is that the very definition of education is hijacked. Learning is narrowed, dulled, and reduced to measurable data bits. Teaching as a craft and profession is redefined as script-following and data collecting. During Superintendent Hall’s decade of being superintendent in Atlanta test scores rose and she became the darling of Arne Duncan who hosted her at the White House. Duncan’s policies have coerced state legislatures to increase standardized testing and to tie educator evaluation to test scores. One teacher, who turned a state’s witness, told officials that teachers were under constant pressure from principals who feared they would be fired if they did not meet the testing targets. While some policy makers and test-obsessed school “reformers” may dismiss such cheating scandals as exceptions, these scandals should serve as a wake up call to anyone concerned about the future of our schools. We need to ask some basic questions. Should our children be subjected to endless test prep and hours of narrow skill-driven curriculum? Or instead should they get a well rounded education like what President Obama’s daughters receive at the Sidwell Friends School or what Arne Duncan received as a child at the Chicago Lab School? Should students of color and those from economically disenfranchised families be subjected to narrow, test-driven schooling while children in the most affluent communities receive well-resourced, well-rounded education with much less testing? Why should transnational textbook/testing companies and corporate-backed philanthropic organizations determine the curriculum for our schools? Increasingly parents, teachers, principals, and even school superintendents are speaking out on the over use and negative impact of mass standardized testing. The courageous teachers at Seattle’s Garfield High School not only started a boycott of the MAP tests, but also allied parents and community groups to their cause. Principals in New York spoke out against the use of test scores to evaluate staff and schools. Parent organizations across the nation have stepped up, recognizing that using tests to declare public schools as “failing” is part of a larger plan to close public schools and replace them with privately-run charter schools. Let’s use scandals like that in Atlanta to continue to push to change the national narrative on school accountability. Let’s unite with progressive school board members to hold community reviews on the impact of testing in our schools and to examine reasonable alternatives. Let’s do what’s right for our students. Debunking the Myths of Standardized Tests, by the Chicago Teachers Union. Pencils Down: Rethinking High Stakes Testing and Accountability in Public Schools by Wayne Au and Melissa Tempel.